The United States of America is the best country in the world. The goal of many people in the rest of the world is to live in the United States. I always felt safe living in the United States of America because it is a democracy. The purpose of a democracy is to prevent abuse by government. People who have been victims of abuse by court-appointed guardians say this is not supposed to happen in a democracy like the United States. This kind of thing only happens in third-world dictatorships. But it does happen. I know. I was a victim. I kept asking myself how this could happen in a democracy. That question would not go away. It remained unanswered for four years. In 2016, the answer finally came to me out of the blue. The Probate Court is not a democratic institution. 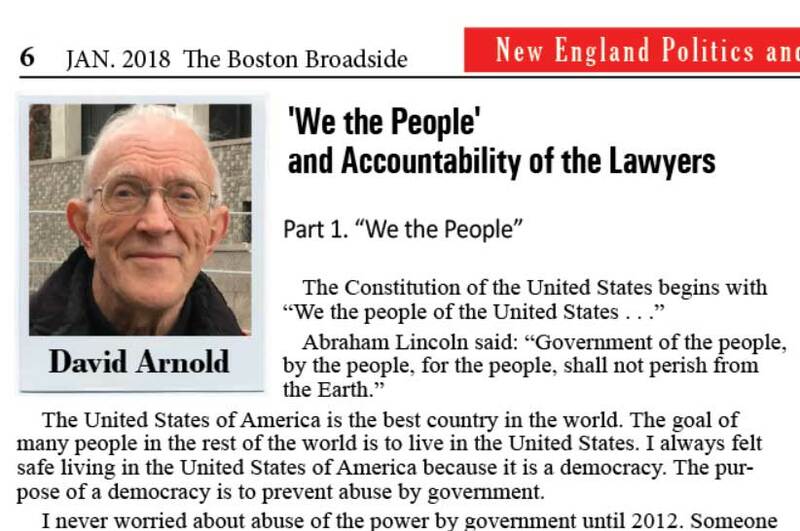 It is a dictatorship (see the December 2017 issue #45 of The Boston Broadside, page 3). The French philosopher Montesquieu who advocated the idea of three branches of government also pointed out that the personnel of the three branches should not coincide. If the same people or entity control all the branches of government, this negates the checks and balances. As the list above shows, the government of the United States is controlled almost entirely by lawyers, not ordinary people from all walks of life. Although the individual people may be different, the same entity – the legal profession – has total control of the Judiciary and the Legislature, and a lot of control over the Executive Branch. Suppose we change one word in Lincoln’s famous statement so it reads: “Government of the lawyers, by the lawyers, for the lawyers shall not perish from the earth.” In my opinion, this is much closer to the truth. In 2011, there were 1.22 million lawyers out of a total population of 311.7 million. This means that 0.4 percent of the total population controls two of the branches of government. The representation of lawyers in the legislature is 150 times greater than their percentage of the total population. We cannot blame the lawyers for controlling so much of our government. We the people elected them. If this is a problem, we have only ourselves to blame. It is not surprising that so many legislators are lawyers. Knowledge of the law is needed to draft good legislation. On the other side of the coin, the Legislature is supposed to represent the interests of ordinary people from all walks of life, not just lawyers. After Gretchen died, I filed complaints with all three branches of government. 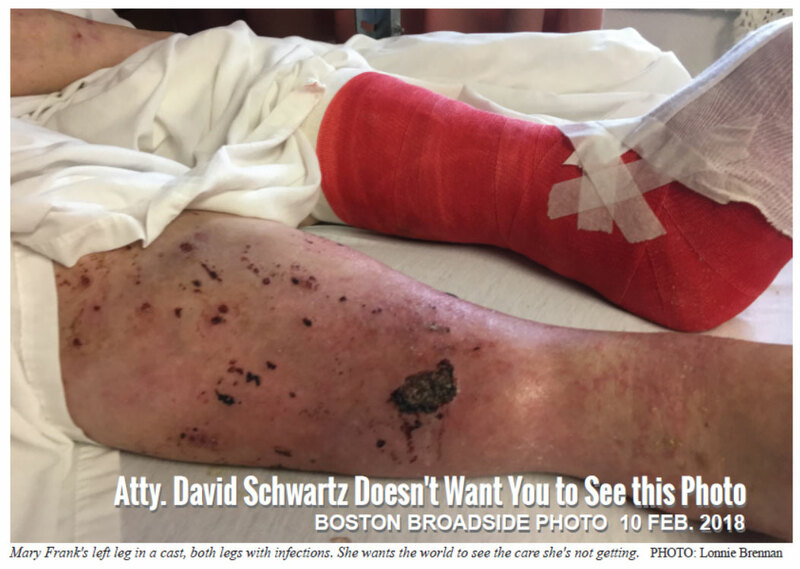 Two other parties also filed complaints to the court, on a website, and in an article published in the September 2017 issue #42 of The Boston Broadside (page 16). None of these complaints had any effect. All these complaints ended up in the hands of a lawyer or a judge who did nothing. In 2012, Gretchen’s son and daughter-in-law filed a blistering complaint with Judge Gorman asking for the removal of the professional guardian, Regina Bragdon. Instead of removing the guardian, the judge approved a motion by the guardian’s attorney, Lawrence K. Glick, giving the guardian more authority. In 2014, I filed a complaint with the Joint Committee on Elder Affairs of the Massachusetts Legislature. The complaint was handled by Kelly Love, Esq., the director of research for the Committee. She was sympathetic but did nothing. She took another job without leaving any notes on this case. In 2015, I filed a complaint with the Middlesex District Attorney. The person I talked to on the phone was a personal friend of the professional guardian Regina Bragdon. The central issue of my complaint was that allowing a guardian to overrule a doctor could enable a guardian to commit an indirect form of homicide by denying necessary care. The neurologists treating Gretchen had to go through college, medical school, and internship. Judge Gorman gave the professional guardian, who had no medical training, authority to overrule all of Gretchen’s doctors. 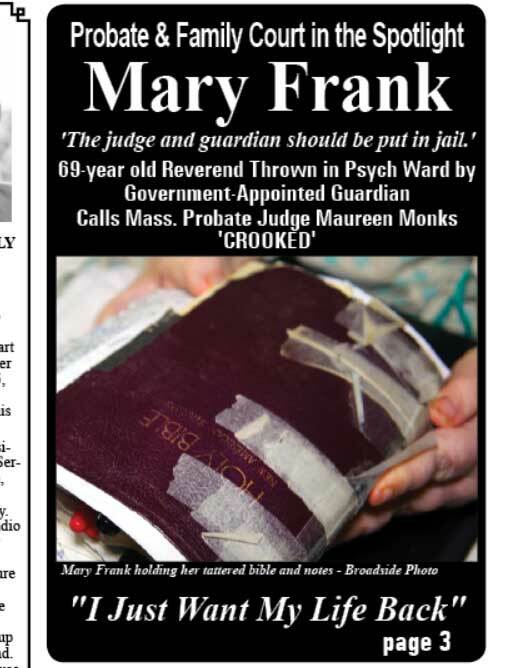 The details of how the guardian kept overruling Gretchen’s doctors are given in the September 2017 issue #42 of the The Boston Broadside (front page). The Office of the District Attorney found no legal grounds for an indictment. The guardian had the legal authority to overrule Gretchen’s doctors. There is nothing wrong with having lawyers in government service. However, the fact that lawyers have so much control over the whole government means that there has to be a good system of accountability for lawyers. One of the organizations working to stop abuse of power by court-appointed guardians pointed out to me that the legal profession is entirely self-policing. This violates a universally accepted principle of law. No person can be his own judge. No profession or entity can be its own judge. Under the Constitution, the Legislature can impeach a judge. However, the Legislature is controlled by lawyers. This tends to negate the checks and balances intended by the Constitution. Review panels for lawyers and judges consist of lawyers, not ordinary people from all walks of life. Review panels for judges and lawyers should be comprised of ordinary people from all walks of life. There should be a system for filing indictments against a lawyer that is not controlled by lawyers. A lawyer may not have the same goals as the client he represents. The practice of law is an occupation of common right. The legal system should be user friendly so people can represent themselves.